There will be no runner drop off allowed at the museum the morning of the race. All 3 gates (see map) will be entry only until 8:30 a.m. Any car entering through the gates should plan on staying on the museum grounds until 8:30 a.m. or later when the gates will open to exiting traffic. 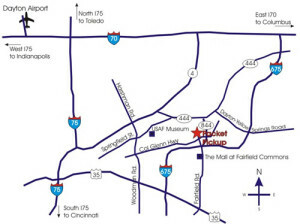 On Saturday morning starting at 3:30 a.m., shuttle buses will begin shuttling runners from the Wright State University Nutter Center to the start line area at the museum. Shuttles will continue to run every 5 minutes until 5:00 a.m. You can drop off runners at the Nutter Center and meet them at the finish line after 8:30 a.m. or pick them up again at the Nutter Center after 8:30 a.m.
Runner shuttles will make a return trip, bringing runners from the finish line back to the Wright State University Nutter Center. The runner shuttles will depart from the National Museum of the United States Air Force starting at 8:30 a.m. until 2:00 p.m. Actual departure times are to be determined. Buses are for RUNNERS ONLY and your race bib must be visible. Spectators and family members will not be allowed to board the runner shuttles. 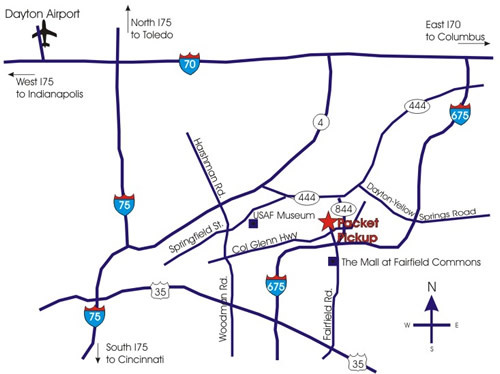 The main museum gate on Springfield Street will open starting at 8:30 a.m. for runner pick-up. Park in the main museum lot and meet your runner at the family reunion area near the festival tent. There will be no vehicle entries allowed through the main museum gate for runner pick-up until after 8:30 a.m.
On race day, plan on arriving at the museum 1½ to 2 hours before your scheduled race start. Those coming from the east or west on I-70 should exit at I-675 South (exit 44A). Turn right onto N. Fairfield Rd. and follow straight to the Nutter Center. Those coming from the north on I-75 should exit at I-70 East (exit 61A). Travel to I-675 South (exit 44A). Those coming from the south on I-75 should exit at I-675 North (exit 43). Turn left on N. Fairfield Rd. and follow straight to the Nutter Center. Travelers from SR35 (east or west) should exit at I-675 North. 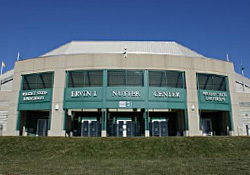 Turn left onto North Fairfield Road and follow straight to Nutter Center.